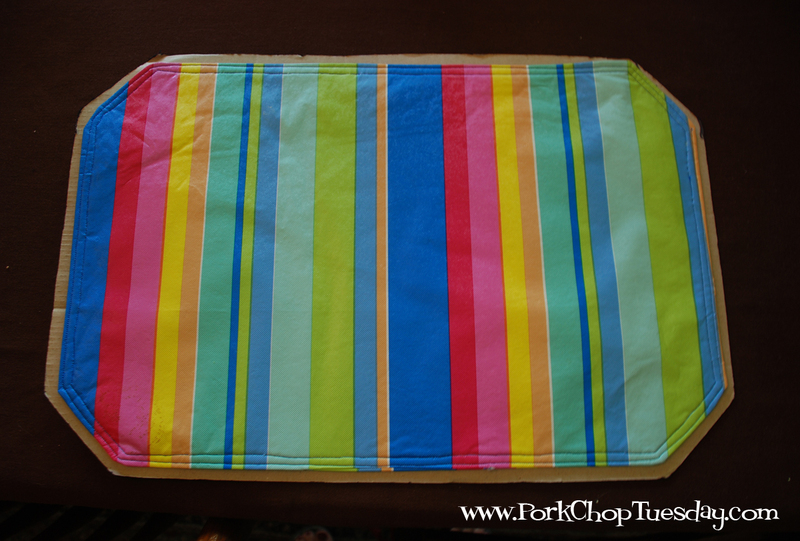 I thought I would share a DIY placemat project. 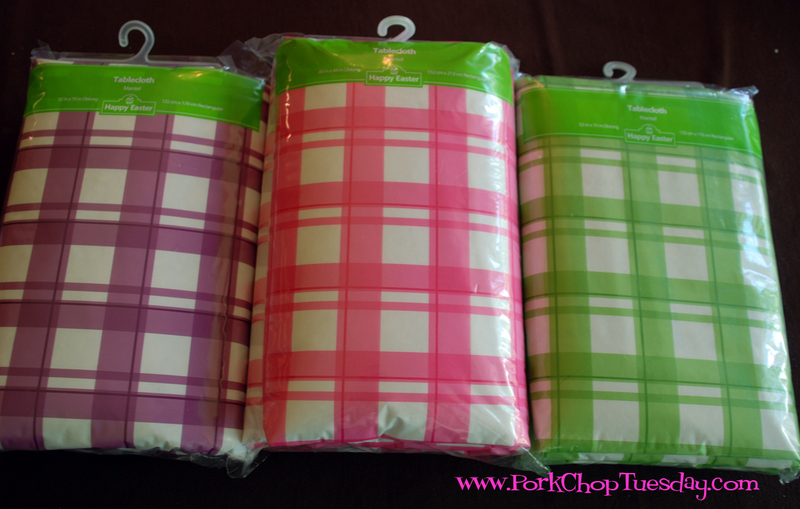 I picked up these vinyl tablecloths a couple of years ago on an “after Easter” sale. They were only 10¢! How could I refuse?! Yes, I bought many more than what you see here. At least I had a plan for them! Hoooray! Miracles DO happen! 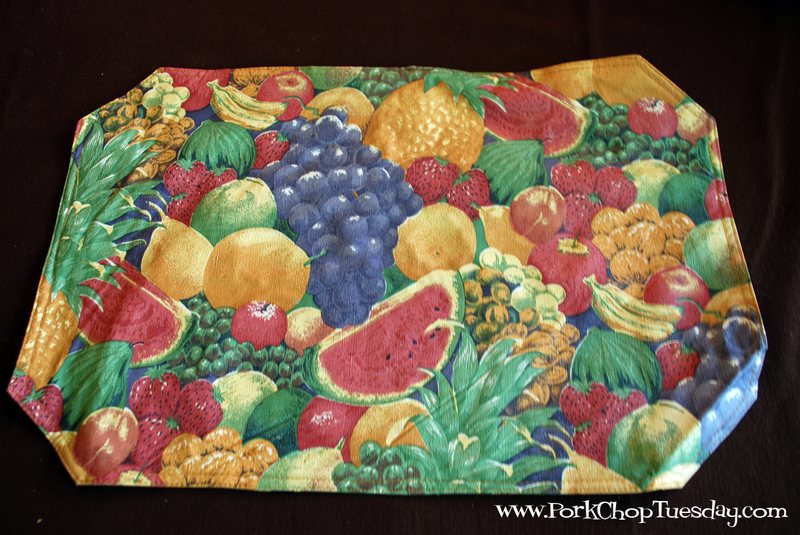 When I got married, my Mom made me these great placemats as a wedding shower gift. I think she got the fabric at Joann or somewhere like that. They don’t look 20 years old, do they. They have gotten a TON of use. Vinyl is the way to go with kids. Just sponge off the mess and you are good to go. 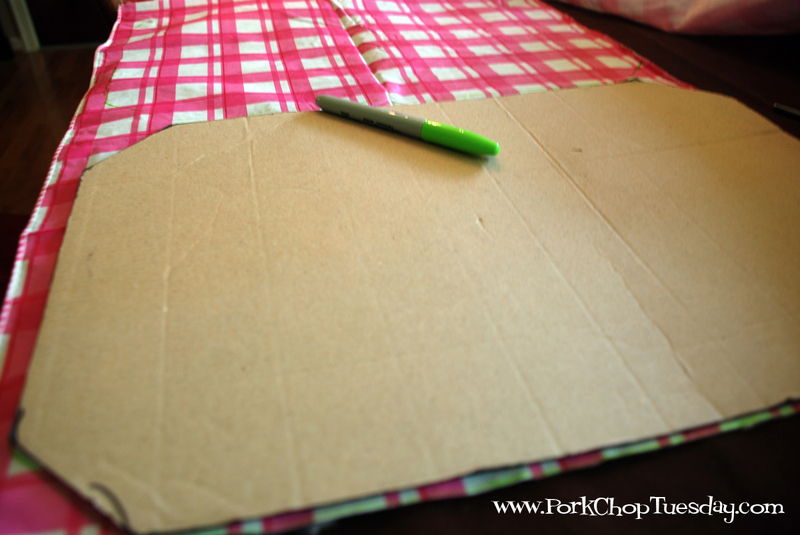 When my girls were little, I used these placemats to make a cardboard template. 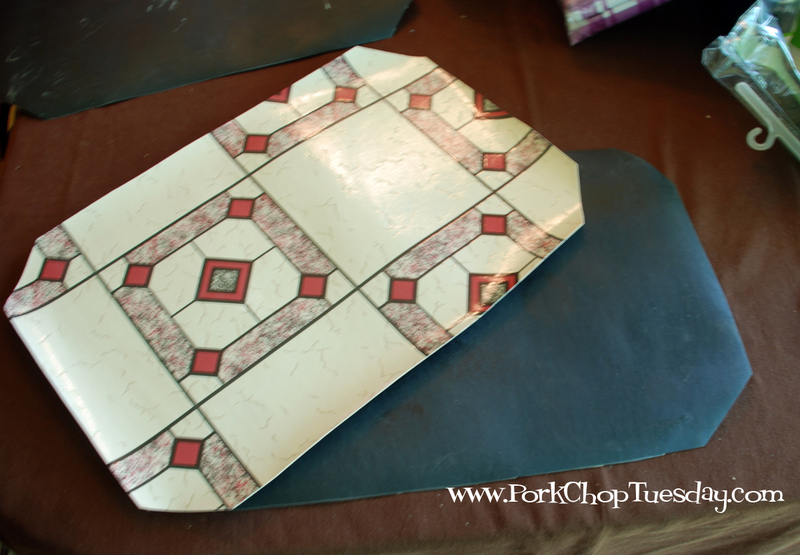 I then used that template on some leftover, new, vinyl kitchen flooring. I painted the back side with chalkboard paint. Guess I was ahead of the trend. That was about 10 years ago. Who knew? My kids never used these much. They don’t like the feel or sound of chalk. About 6 or 7 years ago, Walmart had some cute fabric-backed vinyl, so I made me some cute new placemats with my same template. That was back when Walmart carried fabric. 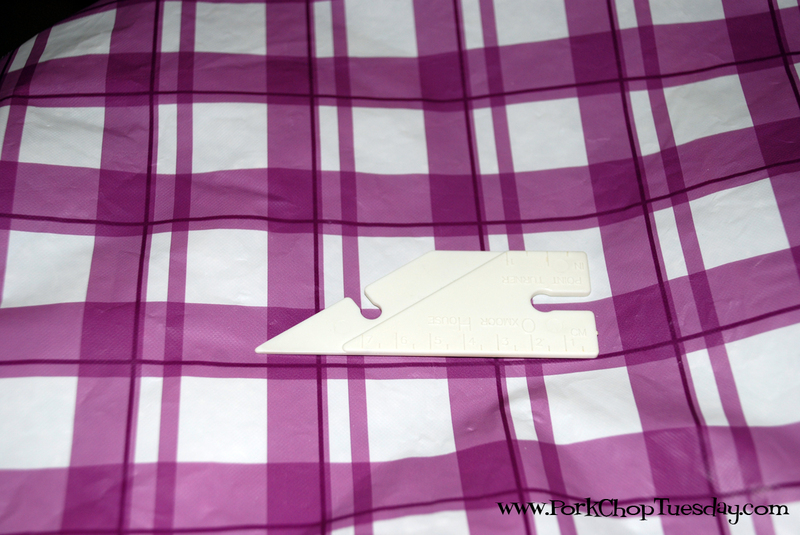 This was easy for me because I could just trace my existing placemat 1/4”-5/8′ wider to allow for the seam allowance. The long sides are 13 3/4 inches. The short sides are 7 3/4 inches. The corner pieces are 2 3/4 inches. Now, let me just say, I don’t sew a lot. 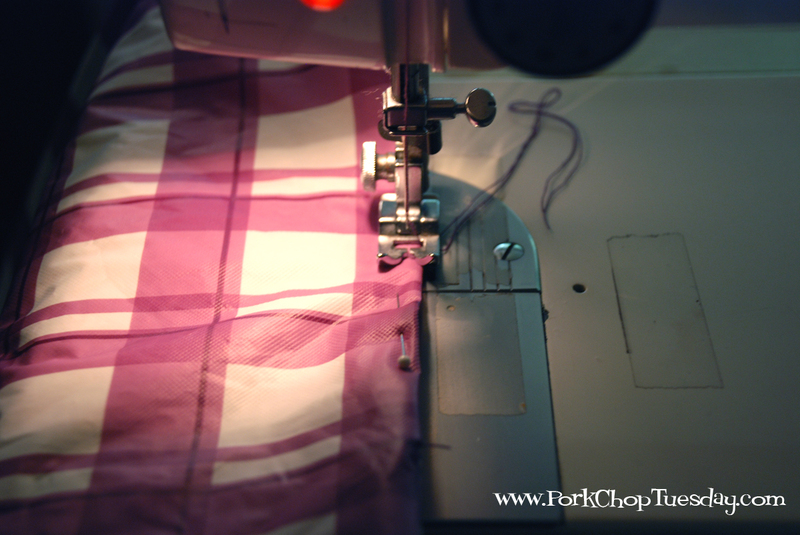 I have to give myself a refresher course every time I use the sewing machine. You may notice a mistake or two. Try to ignore them! Ok, I’ll point out the first one for you. I should have ironed the fabric. I just placed my template down on a “smooth” part and hoped for the best. So much for “the best”. I couldn’t stand it! So I had to do something. 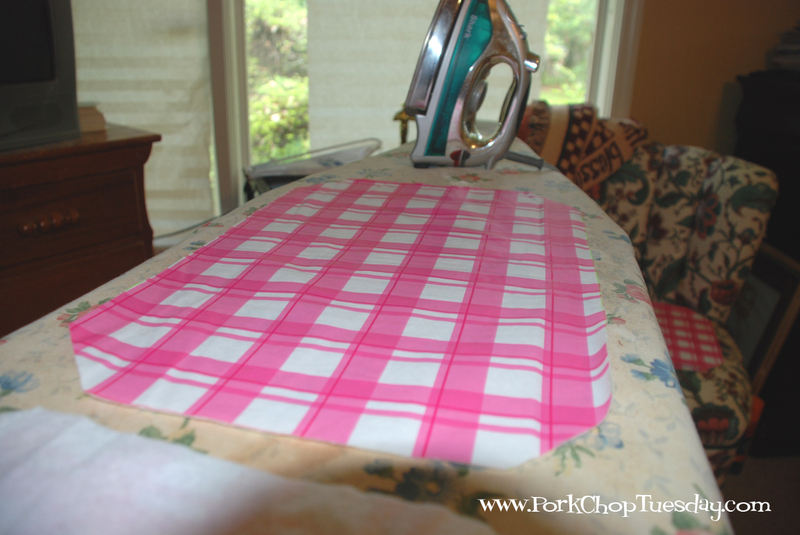 Yes, I ironed the vinyl–ON THE BACK! Use some common sense here. Hot iron+plastic=huge mess. 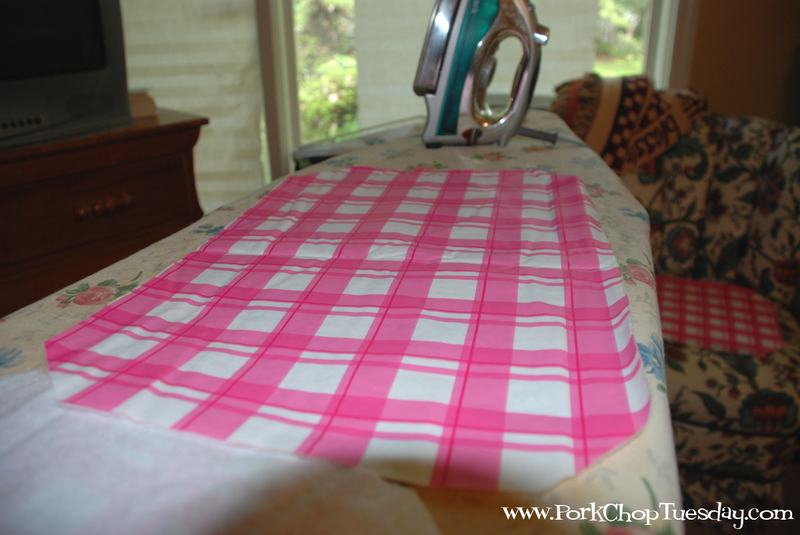 IRON ON THE FABRIC SIDE! Ta Da! Now, isn’t that better? You may have noticed the green Sharpie a couple of pictures ago. I used that to do my tracing. It will be on the inside, so it won’t show. I didn’t use a black because I thought it might show through the white part of the vinyl. 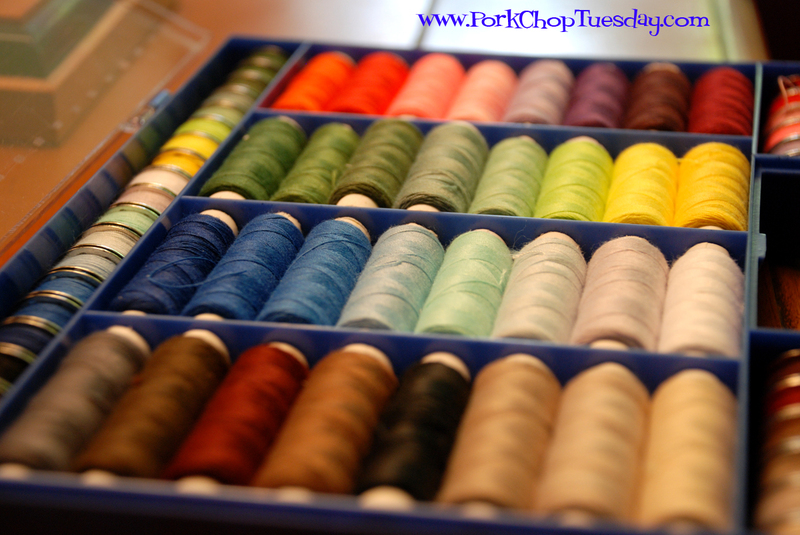 Next, you get out your fabulous box of thread your Mother-in-Law brought you back from Germany. Oh, sorry. Guess that was just me. Oooo! Ahhhh! I know you are jealous. I’ll quit. 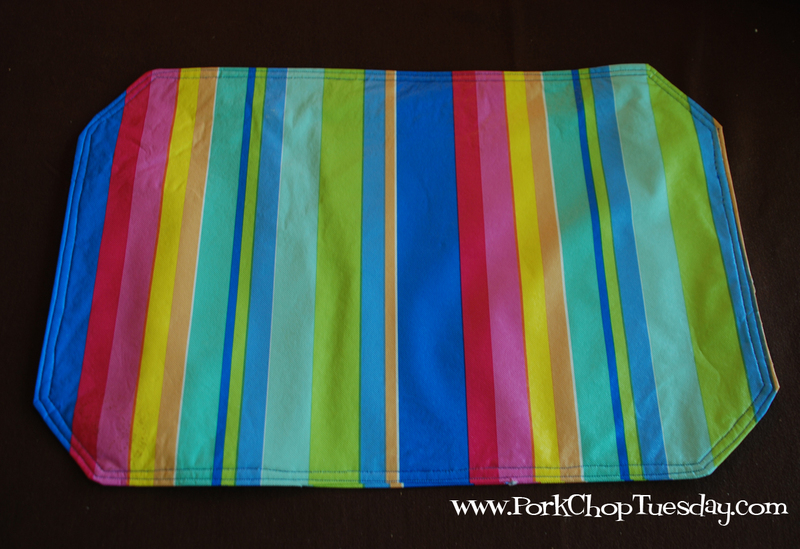 With right sides together, sew around your placemat. Use whatever seam allowance you like. I tend to go with a 1/4″. See that space where there is no stitching? Be sure to leave an opening, unless you like the cheesy fabric side better. 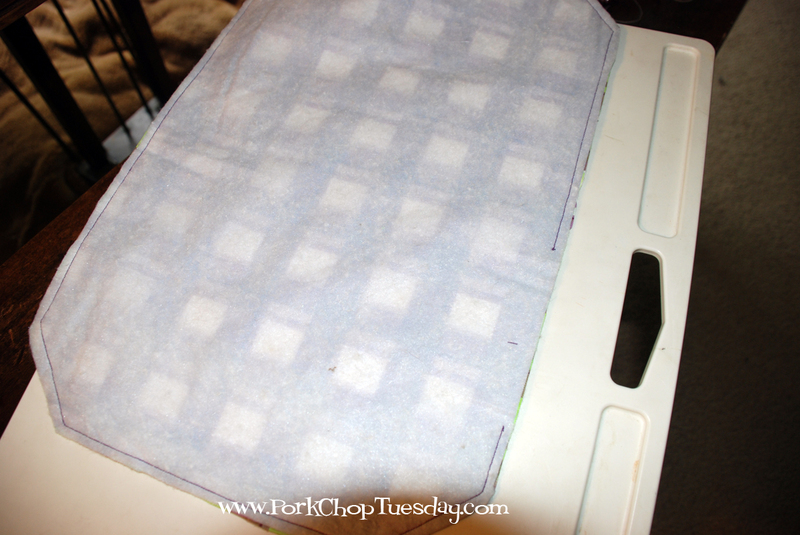 Turn you placemat right-side out. That is why you left the opening. Sorry, no pictures of me wrestling placemats. You do want to have nice crisp corners on you placemats. I used this little corner tool. I’m pretty sure you can find them at fabric shops. I have had mine forever. You don’t have to have one. You could use something like a chopstick to push out those corners. Now top stitch all the way around the mat. 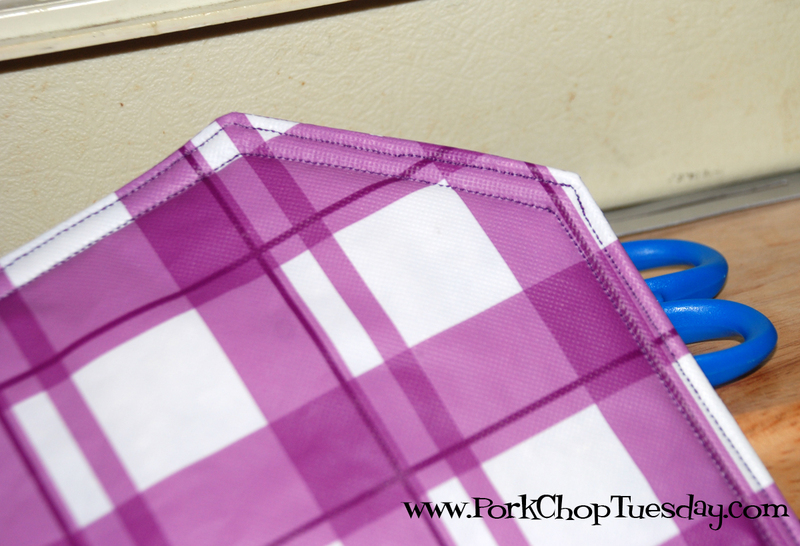 Remember to tuck in the seam allowance on the opening. 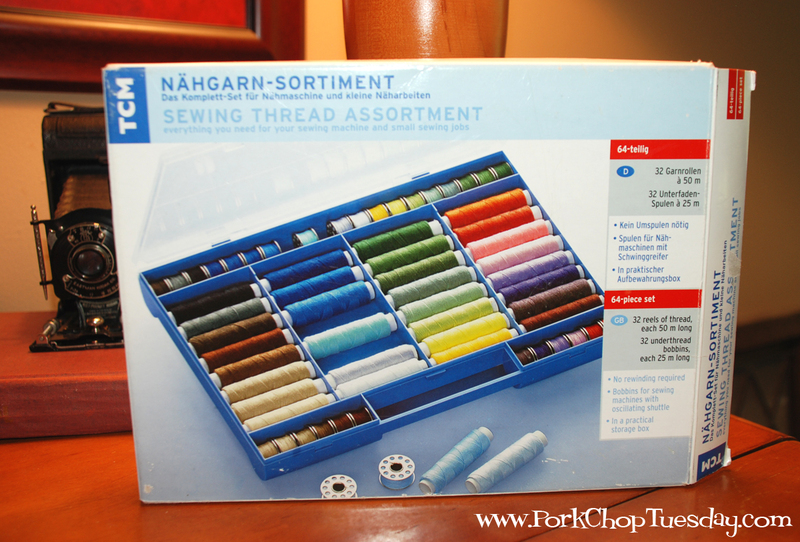 I made two rows of stitching around my set. I think it looks a little fancier that way. Make them all the same or different colors. Give them as gifts or keep them for yourself. 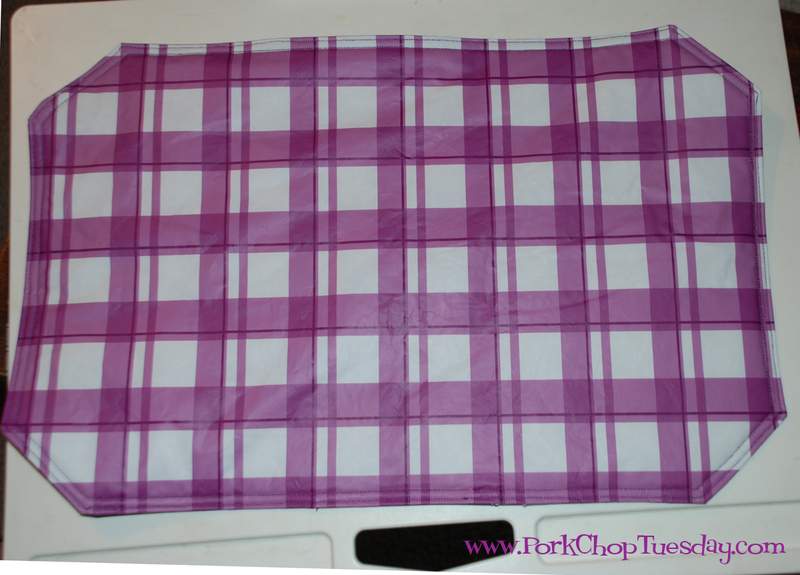 Be sure to look for vinyl tablecloths at those post-holiday sales. Maybe you can get a bargain like I did! Can’t wait to see how you use them. Mission g y’all! That’s supposed to say missing y’all. I love the placemats. I just got a new machine that embroidery’s so I can’t wait to make a few. Your place mats are very pretty, and the tutorial is great! 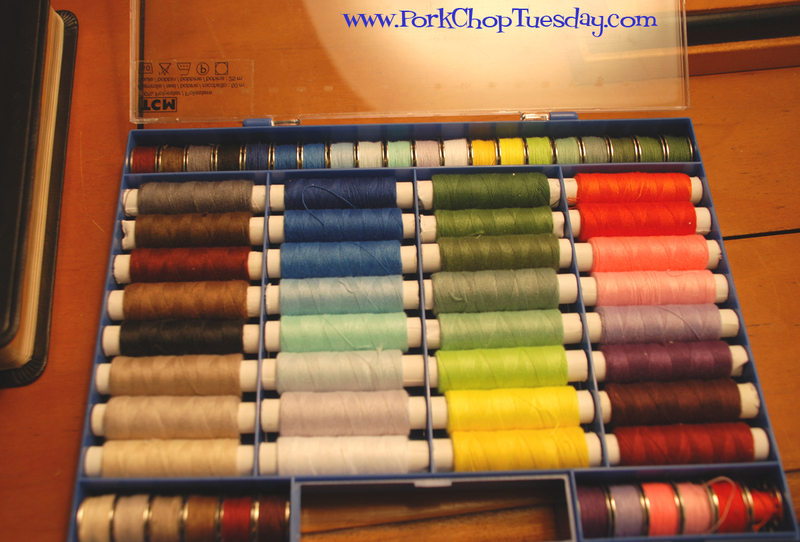 I do envy that box of thread! I found some cute Easter things today half off, but no table cloth, I’ll keep it on my “watch for” list!